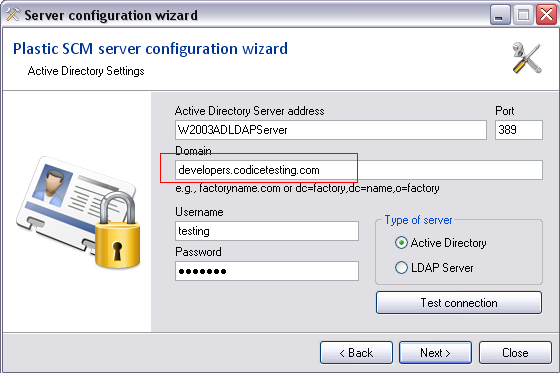 Recently we have experienced an issue when configuring the system authentication mode to Active Directory. The Active Directory tree contained more than 3000 entries. By default, Active Directory allows fetching only 1000 entries foreach search request to the Active Directory Domain. The main reasons of this limit are security and performance. If a search query to the Active Directory returns more than 1000 results, the ActiveDirectory throws an exception (sizelimitexception, LDAP error code 4). 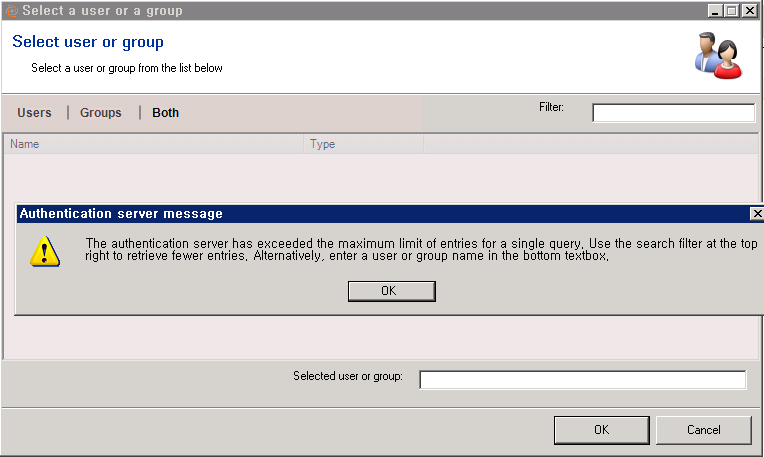 Close the warning message and specify a filter on the "Filter" textbox from the User Selection dialog. Doing this, Plastic SCM will filter the query to the Active Directory domain, and will retrieve less results than before. - The specified filter has to return less than 1000 results. Specify a subdomain to the PlasticSCM server configuration instead of the entire Active Directory domain. Doing this, Plastic SCM server will query only for users and groups from the specified subdomain. You can perform this change through the server configuration wizard. - The list of users/group on the subdomain contains less than 1000 entries. (Sections: "Starting Ntdsutil.exe", "Viewing current policy settings" and "Modifying policy settings"). Run "Ntdsutil.exe" on the Active Directory machine. 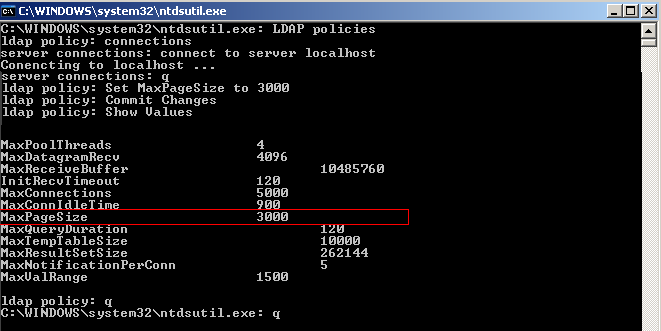 At the "Ntdsutil.exe" command prompt, type "LDAP policies"
At the "LDAP policy" command prompt, type "connections"
At the "server connection" command prompt, type "connect to server MYHOST.mydomain.com"
At the "server connection" command prompt, type "q"
At the "LDAP policy" command prompt, type "Set MaxPageSize to NEW_VALUE"
At the "LDAP policy" command prompt, type "Commit Changes"
At the "LDAP policy" command prompt, type "q"
At the "Ntdsutil.exe" command prompt,type "q"
I play soccer, like cars, love telling near to true stories and I'm also learning to play electric guitar. You can reach me at @ilovemerge. Why not use Active Directory paging mechanism ? At the moment, the paging mechanism is not implemented. The posted solutions works with current releases.